The Charge Wizard is designed to plug into the standard TCMS port located on the front of all models of the Inteli-Power 9100 Series Converters (see drawing below). The Charge Wizard is a microprocessor-controlled unit that constantly monitors the RV battery voltage and then selects one of three charging voltages and one of four operating modes to properly re-charge or maintain the RV battery. The addition of the Charge Wizard makes your 9100 Series converter an intelligent battery charger that will safely and rapidly recharge a discharged battery by selecting the Boost Mode (14.4V) of operation. Once the battery reaches 90% of full charge, the Charge Wizard automatically selects the Normal Mode (13.6V) to safely complete the charge. The Storage Mode (13.2V) is automatically selected after 30 hours of non-use of the 12-volt RV electrical systems. The lower charging voltage in the Storage Mode of operation reduces battery gassing and water usage, while maintaining the charge. Every 21 hours when the system is operating in the Storage Mode, the Charge Wizard will automatically switch to the Equalizing Mode of operation. The Equalizing Mode increases the charging voltage up to 14.4 volts for 15 minutes. This increased voltage mixes up the battery electrolyte and prevents battery stratification and the resulting problems of battery sulfation. 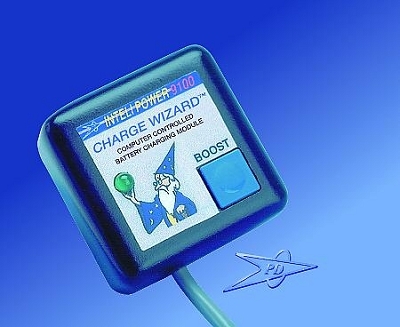 The Charge Wizard is a microprocessor-controlled device designed to operate exclusively with Progressive Dynamics 9100 Series Inteli-Power Converters. It constantly monitors the RV battery, then automatically adjusts the converter output voltage based on its charge status. The Charge Wizard has four (4) operating Modes (BOOST, NORMAL, STORAGE AND EQUALIZE). Each Mode is automatically selected by the microprocessor and ensures a fast yet safe recharge for your RV battery. The Charge Wizard has a light that indicates the Mode it is operating in as follows. LIGHT BLINKS ON AND OFF APPROX. EVERY SECOND. The Charge Wizard is in the Normal Mode (Converter output voltage set to 13.6-volts). LIGHT BLINKS ON AND OFF APPROX. EVERY 5 SECONDS. The Charge Wizard is in the Storage Mode (Converter output voltage set to 13.2-volts). The Charge Wizard functions are fully automatic however; you can test the Charge Wizards functions manually by pressing and holding the MODE SELECT SWITCH BUTTON DOWN. When the button is first pressed, the light will be ON all the time, indicating it is in the BOOST Mode (converter output 14.4 VDC). If you continue to hold the button, the unit will switch to the NORMAL Mode (converter output 13.6 VDC) and the light will blink approximately once a second. If you continue to hold the button down the unit will go into the STORAGE Mode (converter output 13.2 VDC) and the light will blink approximately every five- (5) seconds. NOTE: No matter which mode you manually select, the Charge Wizard will automatically return to the NORMAL Mode of operation after 4 -hours. The chart above shows the amount of time it took a PD9155 (55-amp) converter set to three different output voltages to recharge a 125 AH (Amp Hour) battery after it was fully discharged to 10.5-volts. 14.4-VOLTS (Boost Mode) Returned the battery to 90% of full charge in approximately 3-hours. The battery reached full charge in approximately 11 hours. 13.6-VOLTS (Normal Mode) Required 40-hours to return the battery to 90% of full charge and 78-hours to reach full charge. 13.2-VOLTS (Storage Mode) Required 60-hours to return the battery to 90% of full charge and 100-hours to reach full charge. As you can see the Charge Wizards ability to increase the voltage of our converters from the Normal Output Voltage of 13.6-volts to 14.4-volts in the Boost Mode, will significantly reduce the time it takes to recharge your RV battery. The lower voltage 13.2-volts Storage Mode, prevents battery gassing and water loss allowing you to keep your RV plugged into 120 VAC power during storage to maintain the battery at full charge.